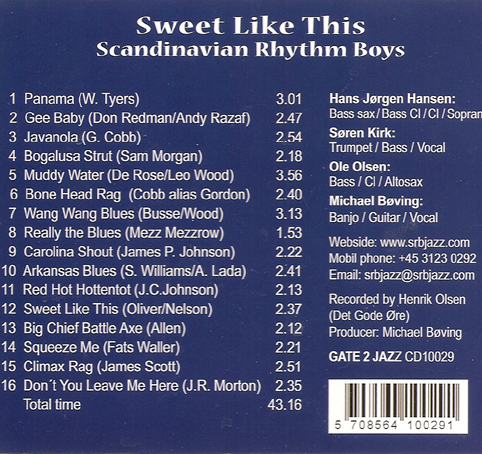 At the end of last year, a wonderful CD arrived in the mail — by one of my favorite [not sufficiently well-known] small bands, the SCANDINAVIAN RHYTHM BOYS, a fertile crescent of hot jazz supervised beautifully by banjoist / singer Michael Boving. The SRB has (or have) been making music since 1997, and we are all the richer for their devotion to the art. They do not seek to reproduce precisely hallowed recordings. Rather, they take memorable melodies and great spirit and make them their own. And they are wise as well as swinging: songs are presented with their verses, and at tempos that feel just right. They respect the music, but their playing isn’t pedantic; rather, one can feel an impudent playfulness bubbling up from beneath. Some readers might wonder whether the SRB are a quartet trying to sound like a full ensemble. Heavens, no: a deep listening session with this disc might make you wonder why other bands need those additional musicians, the overall music and musicality is so satisfying. And the instrument-doubling comes off beautifully, giving the disc (and the band) an ever-changing variety. In the age of extended performance, others might wonder why the SRB performances are uncharacteristically brief. The answer is also brief: they can do more in three minutes than some bands can do all week. Consider, for a moment, WANG WANG BLUES — which runs just over three minutes. A brief tour, if you will allow me. The sprightly performance starts with the verse, agile clarinet taking the lead over trumpet commentary and stringed rhythm. Then, some neat riffing by the horns. When the band shifts into the chorus, the clarinet is still in the lead, with trumpet echoing the melody, the banjo and string bass making themselves heard and felt. This section (the first third of the performance) is a sweet throwback to the hot dance records of the Twenties and early Thirties: let the dancers hear the melody, neatly harmonized or in unison, to dance to. No violent improvisations, no hot polyphony. Not yet. At this point, many bands would launch into solos or into ensemble jamming. But the SRB has other things, very happy ones, in mind. The instruments stop, and the four musicians sing the chorus a cappella, Michael leading them, then repeat it, adding rhythm. It’s utterly charming, and makes me think happily of a vaudeville act where the musicians did everything to entertain. Vocal interlude over, the horns set a Basie-out-of-Louis harmony riff behind an arco bass statement of the melody (with nice intonation) backed by banjo. (Incidentally, Michael is a very subtle banjo artist, a model for those who choose that instrument.) The final forty-five seconds of this performance offer a gentle mix of polyphony, trumpet in the lead, with a few passages where the horns take the famous melody lines together. When I first heard this performance, I got stuck on it — and it wasn’t a defect in the disc. I played it five or six times in a row, delighting in its fresh generosity. And its honesty: it continues to feel authentic to me, deep music made by people who have chosen it as their vocation. Hear for yourself! Click the top-right speaker icon here. I rest my case. The SRB is busy making “old” music fresh, lively, and new. I salute them. To purchase the CD, please email Michael Bøving at srbjazz@srbjazz.com — or, if you feel like a chat, his phone is 0045 31230292. And “Keep hot” is how Michael signs his letters and emails. A good spiritual philosophy. 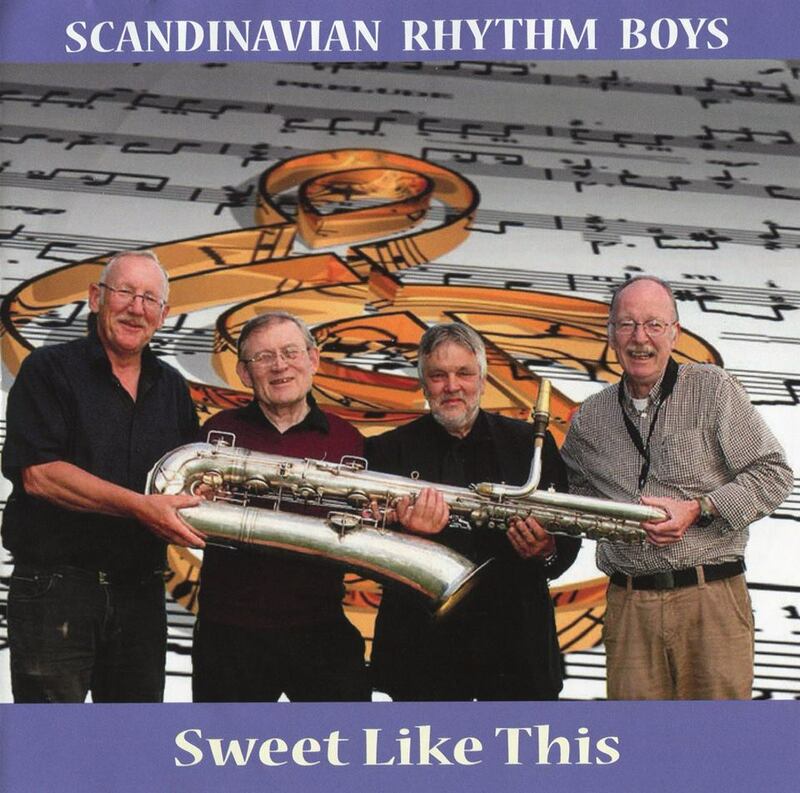 This entry was posted in "Thanks A Million", Bliss!, Generosities, Hotter Than That, Irreplaceable, It's All True, Jazz Titans, Pay Attention!, Swing You Cats!, That Was Fun!, The Heroes Among Us, The Real Thing, The Things We Love, Wow! and tagged authentic music, ensemble polyphony, Hans Jorgen Hansen, hot jazz, Jazz Lives, Michael Boving, Michael Steinman, Ole Olsen, Scandinavian Rhythm Boys, Soren Kirk. Bookmark the permalink. Some of my best friends are drummers, but you might enjoy this group — as I do. A band doesn’t need drums if the rhythm section is solid. (Those words being spoken by an ex-drummer.) I worked without drums in New Orleans for many years. Better to have no drums when a sympathetic drummer is not available.